This tutorial will introduce how to control your turtlebot robot using speech recognition. Make sure that you completed installing all the required packages in the previous tutorials and your network set-up is working fine between the ROS Master node and the Host node. In order to download the pocketsphinx package on Ubuntu you need to install the gstreamer0.10-pocketsphinx and the ROS sound drivers. You do not need to worry about connecting the audio input stream with your PC or publishing a topic because the node recognizer.py in the pocketsphinx package does all the work for you. First, you need to test if the recognizer is working. To get the best result it is better to have an external Mic connected to you PC either by USB, standard audio or Bluetooth. Make sure that the Mic you are using is the one that is selected in the sound settings in your PC. Try to test your Mic before hands to make sure that the quality is good and check the volume meter. You can also try different words. It might be possible that the recognizer will detect words different from what you pronounced. This may be due to (1) bad microphone, in this case try to get a high-quality microphone, (2) your pronounciation is not clear enough. In this case, try to repeat the word. 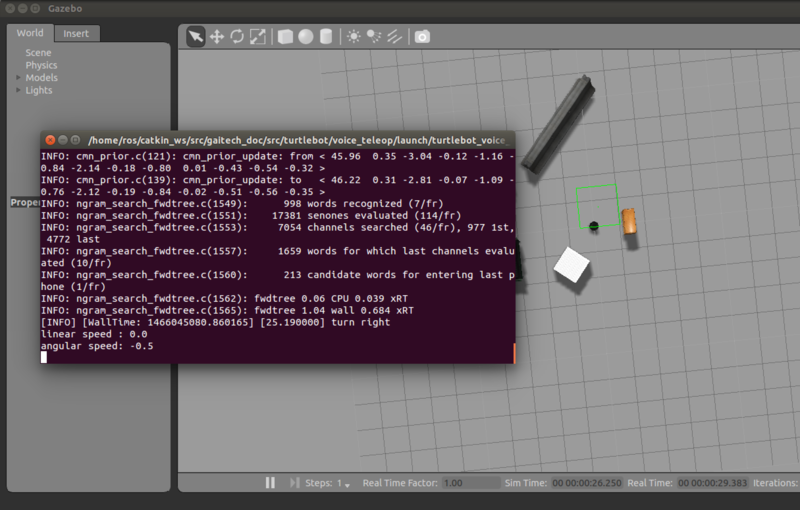 If the recognizer successfuly detected your spoken word, you can move to the next step to talk to your robot. Try saying a word that is not in the list such as “the food is hot” and see the results on the topic /recognizer/output, which will show something different. The recognizer will always try to find the nearest match to the word you say. Make sure that you mute the recognizer when you are not using it because this will send random data to the robot. Now, you are done with creating the ROS package. In this section, you will learn how to add a vocabulary or corpus as it is specified in the PocketSphinx. In partiuclar, we will create a simple vocabulary of commands to move the turtlebot robot forward, backward, and rotate it left and right. Feel free to add/delete/change any command you want as long as you follow the conventions. Do not use punctuation marks and pay attention to the upper and lower case letters. If you want to add a number you will have to spell it so you can not write 1, 55, 87..etc instead write one, fifty five, eighty seven. After editing the motion_commands.txt file, you have to compile it into special dictionary and pronounciation files so it matches the specification for the PocketSphinx. The online CMU language model (lm) tool is very useful in this case, visit their website and upload your file. Click on the Compile Knowledge Base button, then download the file labeled COMPRESSED TARBALL that contains all the language model files that you need and the PocketSphinx can understand. Extract these files into the config subdirectory of the gaitech_edu package (or your package where you are working this example). These files must be provided as an input parameter to recognizer.py node. To do so, you need to create a launch file as follow. If your package name is different from gaitech_edu make sure to consider this in the instruction value="$(find gaitech_edu) of the launch file. Otherwise, ROS will not be able to find the parameters. Make sure that you put the correct path for the lm and dic files. 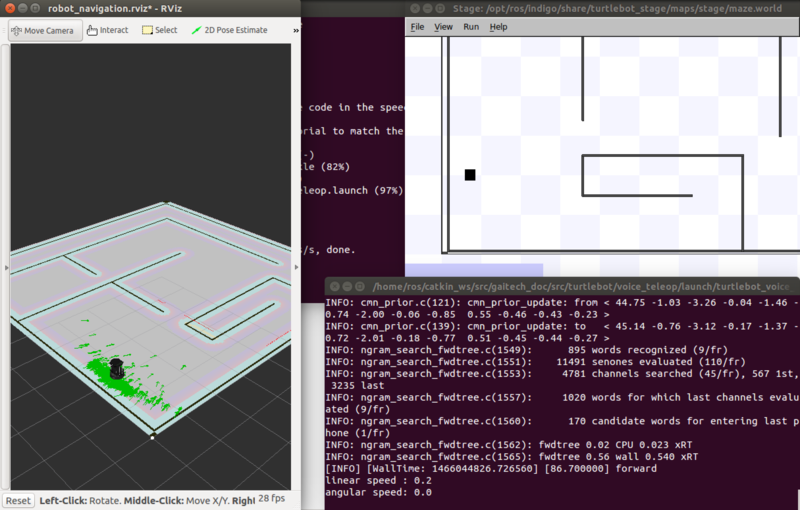 This file runs the recognizer.py node from the pocketsphinx package mentioned before in this tutorial. The last parameter which is output="screen" is used to let us see in real-time the recognition results in the launch window. Make sure to close all the running launch files and all the demos running from previous examples before you run the previous commands. In this section, we will present a small program src/turtlebot/voice_teleop/voice_teleop.py (voice_teleop.cpp for C++) that will allow you to control your turtlebot robot using voice commands. The idea is simple. The program will subscribe to the topic /recognizer/output, which is published by the node recognizer.py node of the pocketsphinx package using the dictionary of words that we create above. Once a command is received, the callback function of the subscribed topic /recognizer/output will be executed to set the velocity of the robot based on the command received. # Subscribe to the /recognizer/output topic to receive voice commands. # Initialize the Twist message we will publish. # We have to keep publishing the cmd_vel message if we want the robot to keep moving. To execute the code, we create the following launch file called turtlebot_voice_teleop_stage.launch that will run the recognizer.py node, voice_teleop.py node and turtlebot_stage simulator. It is important to note the topic remapping instruction <remap from="/cmd_vel" to="/cmd_vel_mux/input/teleop"/> in the launch file for the voice_teleop.py node. In fact, the voice_teleop.py node publishes velocities to the topic /cmd_vel, whereas the turtlebot_stage simulator wait for velocities on the topic /cmd_vel_mux/input/teleop. This is the reason why we need to remap the topic /cmd_vel to /cmd_vel_mux/input/teleop. For more information about the <remap> tag, refer to <remap> page in ROS WiKi. Now, test your robot by giving it any command from the list of commands you create above. Note that it is possible that commands are not correctly recognized if your voice is not clear or your microphone is not good enough. Try with high quality microphone for more reliable results. You can then update the code to add more commands, such as faster, to increase the speed of the robot, slower, to decrease the speed of the robot. The file voice_teleop_advanced.py contains a more elaborated example with more commands. Now, you will test the voice teleoperation with a real turtlebot robot. Before you test the robot make sure that your robot is in an open space with no obstacles or edges next to it. Also, make sure that your computer machine is correctly configured to work with the Turtlebot laptop as in the Network Configuration. Try a simple command at first like the rotate right to avoid any accidents. You can change the robot’s speed by giving the command “go faster” or “slow down” and this will change the parameters for speed in the turtlebot_voice_teleop.launch file. However, you will have to add the commands as mentioned previously in the config/voice_teleop.txt file and redo all he steps again. In this section, you will extend the example above and implement a smarter version of the voice teleoperation application. start_speed : the initial speed used when starting the script. half: sets the linear and angular velocities to the half of their current values. Make sure that all speeds are within the range of the minimum and maximum speeds allowed. After modification, test you code as illustrated above on both simulated and real turtlebot robot. The variables defined above linear_increment, angular_increment, max_speed and max_angular_speed are set based on the user’s preference. It is more appropriate to set these values as parameters into the launch file and then read these parameters from your program or script before using them. Modify the code so that to allow the user to define these parameters from the launch file. You should use rospy.get_param("~param_name", default_value) in Python to read a parameter from a launch file and use nh.getParam("/global_name", global_name) in C++. For more details refer to Python Parameter Server and C++ Parameter Server. Now, you will add a new functionality to either enable or disable the voice teleopration. For this, you need to add two keywords into the vocabulary. resume: when the user says resume, the voice teleopration is resumed and voice commands will be executed again. Make necessary changes to provide these functionalities.